Only 33 vineyards have the privilege of being classed as "Grand Cru", previously referred to as "Tête de Cuvée". 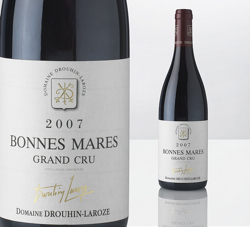 Only the name of the vineyard figures on the label of Bourgogne "Grand Cru". This table is from Wikipedia.Org and it has links to the various vineyard's Wiki entries. Saint-Léger-sur-Dheune is a commune in the Saône-et-Loire department in the region of Bourgogne in eastern France. The inhabitants of Saint-Léger-sur-Dheune are called Léodégariens. The 2007 population census was 1496. The Château de Germolles, palace of the Dukes of Burgundy, is located in the commune of Mellecey, 10km from Chalon-sur-Saône. Philip the Bold (Philippe le Hardi), Duke of Burgundy, bought the stronghold of Germolles for his wife Margaret of Flanders (Marguerite de Flandre) in 1380. 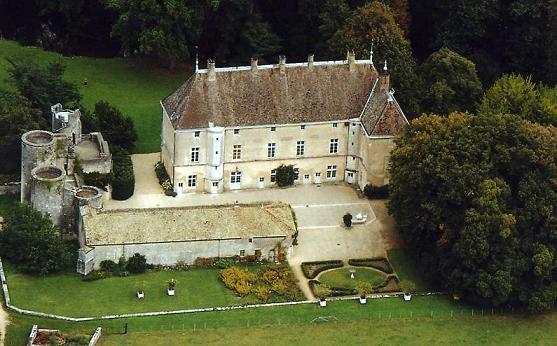 The Duchess transformed it into a luxurious home with the help of the finest sculptors and artists of the Burgundian School (Claus Sluter, Jean de Beaumetz). The tour includes the cellar, the lower chapel, the two towers guarding the entrance (the remains of the original fortress), the great reception room (salle d'honneur), the ducal chapel and apartments, as well as those of the court. The painted and sculptured décors, including the floor tiles, testify to the standing of the château. The hamlet adjoining the château and a 19th century park set out in the English style embellish the setting. It has been listed as a monument historique since 1989. Chalon-sur-Saône lies in the south of the Burgundy region of France with a population of 48,000 in 2006. 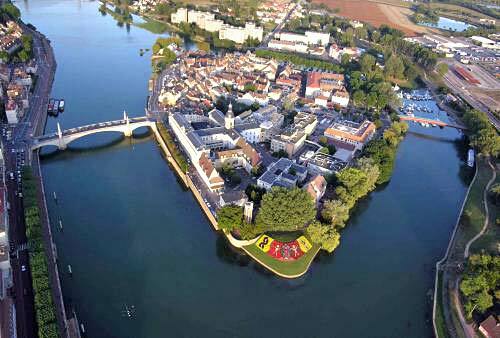 It was built alongside the river Saône about 3000 years ago. During ancient times the town was a naval base, during the Middle Ages it was a large fairgrounds, and in modern times a trading center. Chalon is known as the birthplace of photography. Nicéphore Niépce (1765-1833) was a French inventor and most noted as one of the inventors of photography (1816). Niépce took what is believed to be the world's first photogravure etching, in 1822. The Musée Nicéphore Niépce contains more than two million photographs, along with ancient and modern cameras and other photographic equipment, as well as photographic exhibitions. Another famous resident of Chalon-sur-Saône is Dominique Vivant Denon (1747-1825) who was involved in the creation of the Louvre museum in Paris, converting the former royal palace into a museum after the French Revolution. Every year in July, Chalon-sur-Saône hosts a 4-day international street artists festival, called Chalon dans la Rue (Chalon in the Street). Artists from across Europe and beyond come to the streets of Chalon to perform music, theatre, acrobatics, comedy, etc. 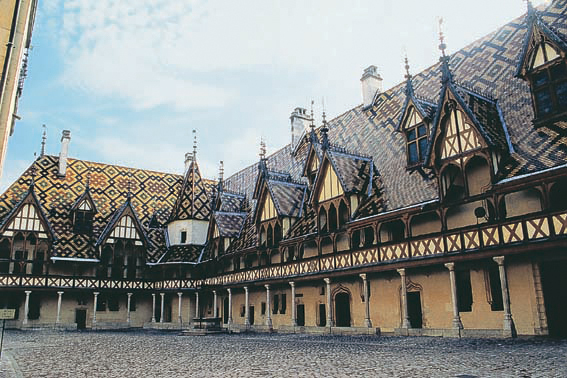 In the middle of the Côte d'Or, Beaune is known as the capital of the wine region. It is one of the wine communes of the Côte de Beaune subregion of the Burgundy wine region. Although Beaune is lacking a Grand Cru vineyard within the commune, it is the hub of the region's wine business, as most of Burgundy's major négociants are located here. Beaune is a walled city with about half of the battlements, ramparts, and the moat, remaining in good condition. 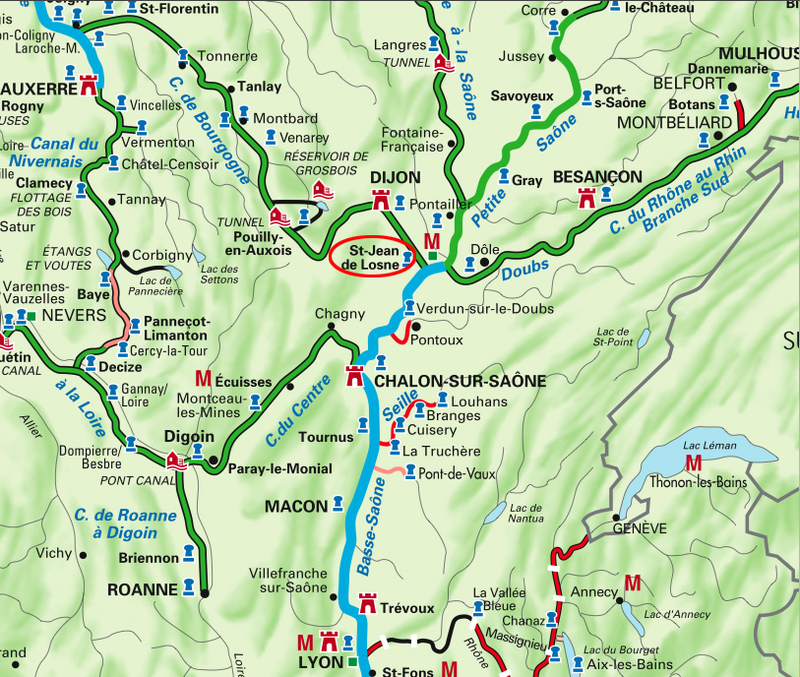 Landmarks include the Halles, the Hospices, the Beffroi, and Notre Dame. The town is also famous for its Baroque Music Festival every weekend throughout July, the Festival Cours Eau Jardins throughout the summer, the Jazz Festival in September, the Hospice de Beaune Wine Auction in November, and the colorful Festival of Saint-Vincent, the patron saint of wine, each January. 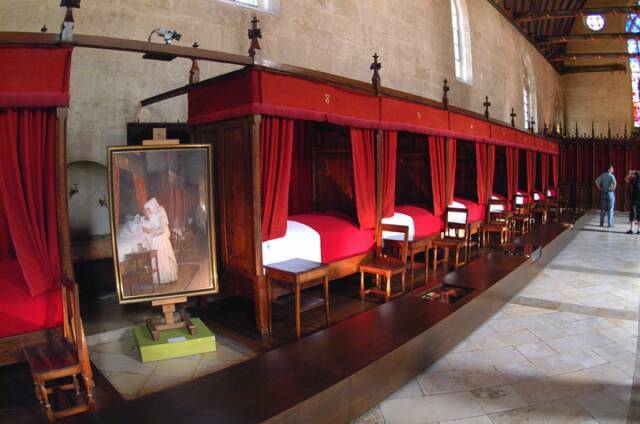 The Hospices de Beaune or Hôtel-Dieu de Beaune is a charitable institution in Beaune, France. The Hôtel-Dieu was founded in 1443 by Nicholas Rolin, the Chancellor to the Duke Philippe-le-Bon (Philip the Good) who was the ruler of Burgundy at that time. The Hundred Years War had recently been brought to a close by the signing of the Treaty of Arras but massacres continued with marauding bands (écorcheurs) still roaming the countryside, pillaging and destroying, provoking misery and famine. 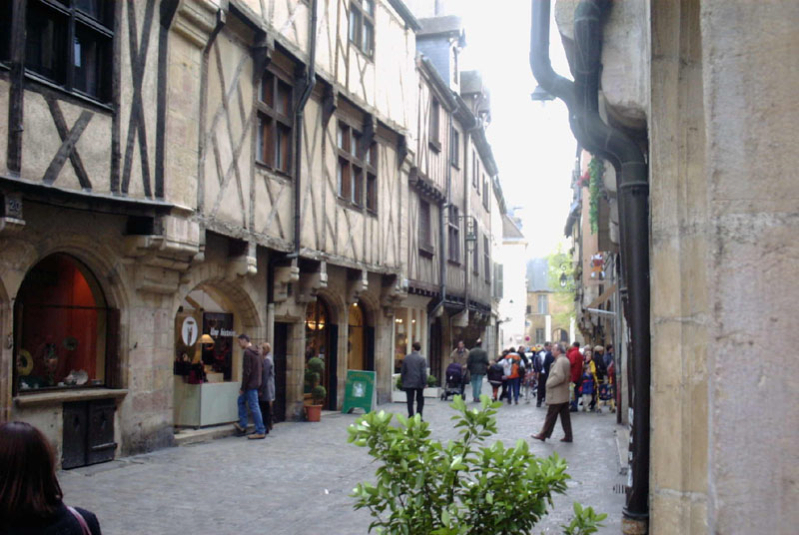 The majority of the people of Beaune were declared destitute. Nicolas Rolin and his wife,Guigone de Salins, reacted by deciding to create a hospital and refuge for the poor giving it an annual income and its own resources, vines and salt works. From the Middle Ages up until the 20th century, the sick were cared for by the Sisters of the Hospices de Beaune in this magnificent building. Its reputation spread far and wide and it became known as the "Palace of the Poor". Many donations of farms, property, woods, works of art and, of course, vineyards, were made by grateful families and generous benefactors. Hospitals in other communes, Pommard, Volnay and Meursault, joined forces to make up the Hospices, bringing with them donations of vineyards, which today total 53 hectares. The institution is one of the best and oldest example of historical, philanthropic, and wine-producing heritage, and has become linked with the economic and cultural life of Burgundy.The famous wine auction, a charity sale, held each November at the Hospices is still reaping the rewards. The original hospital building, the Hôtel-Dieu, one of the finest examples of French fifteenth-century architecture, is now a museum. 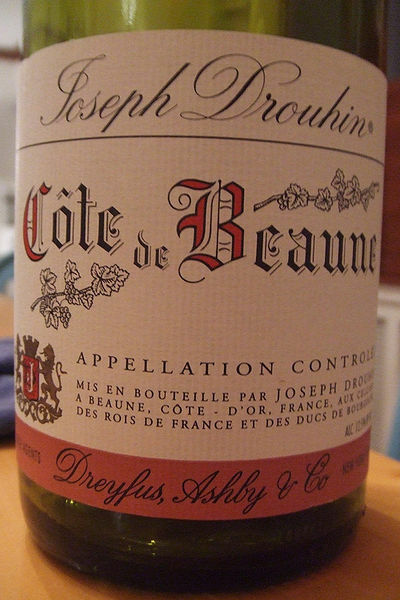 Maison Joseph Drouhin is a French wine producer based in Burgundy that was founded in 1880. 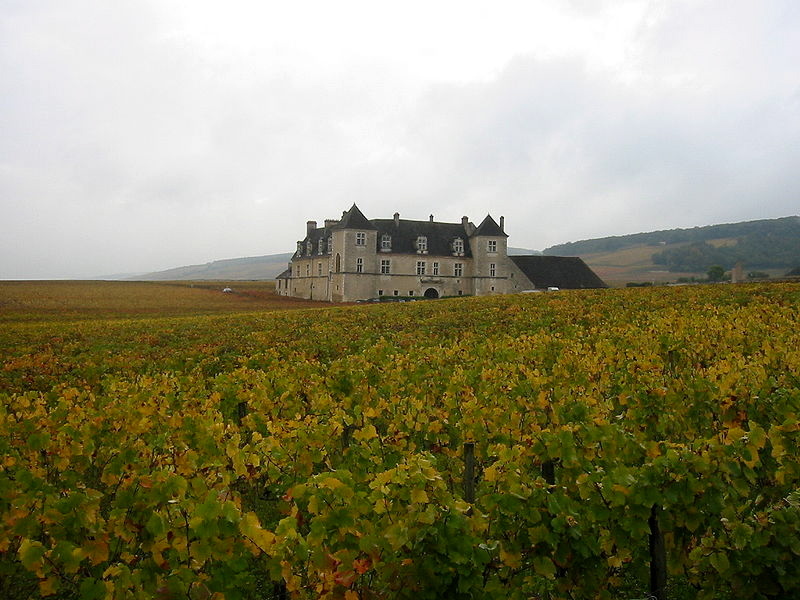 The estate owns vineyards in Chablis, the Côte de Nuits, Côte de Beaune, and Côte Chalonnaise, as well as in the Willamette Valley in Oregon, USA. Joseph Drouhin is also one of the major négociants of Burgundy, and produces wines made from purchased grapes grown in different parts of Burgundy. Today both Maison Joseph Drouhin and Domaine Drouhin Oregon are owned and operated by the great-grandchildren of Joseph Drouhin. 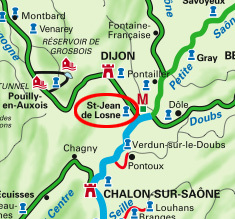 Saint Jean de Losne, while a small town (population: 1207, in 2007), is a very important boating center as it is located at the junction of the Canal de Bourgogne and the Saône river, with the Petite Saône, Canal de la Marne à la Saône, Doubs/Canal du Rhone au Rhin to the north and east, and the Canal du Centre a bit further south. The town was originally built in the 13th century when the Dukes of Burgundy bought the salt works of nearby Salins les Bains. To protect the imports of the salt into Burgundy, a castle was built and the town fortified with battlements and turrets. The salt trade was based here and the town gradually prospered and grew in importance. 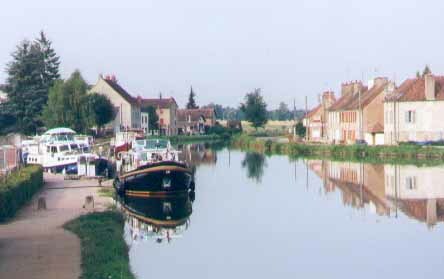 More recently, Saint Jean de Losne has become a "bargee's" town as it provides a great deal of services to the barge industry. There are modern moorings with water and electricity, drydocks, cranes, chandleries, and other shops cose to the water. It is now also an important inland boating center for tourism and pleasure boats with mooring for over 350 boats. William Ponsot established this Domaine in 1772 and it has since developed into one of the finest in the Côte d'Or. There is history of innovation here with it being one of the first Domaines to practise estate bottling in the 1930s, and perhaps more significantly the Ponsots were among the first growers to understand the importance of clones and clonal selection - many of the most important Pinot Noir clones originate from their vineyards. Clos de Vougeot is a wall-enclosed vineyard ("clos") in the Burgundy wine region, and an Appellation d'Origine Contrôlée (AOC) for red wine from this vineyard. It was named for the River Vouge. Clos de Vougeot consists of 50 hectares (125 acres) of vineyards with six soil types split beween 80+ owners. 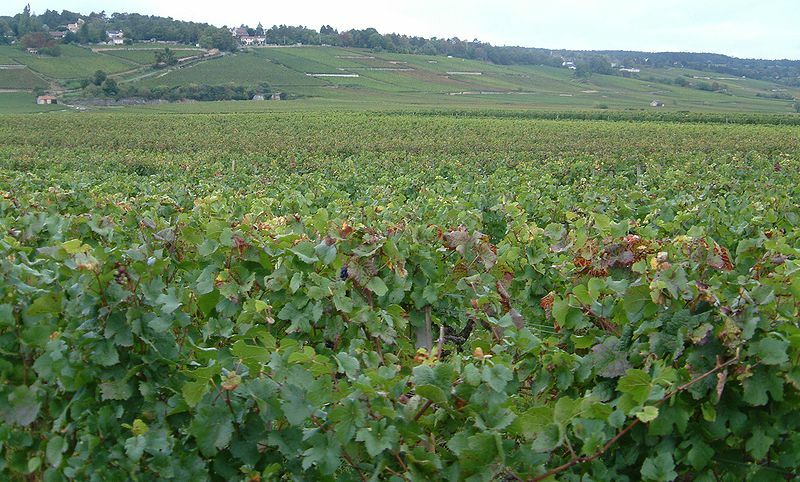 It is the largest single vineyard in Côte de Nuits entitled to the grand cru designation, while Corton in Côte de Beaune is the largest grand cru in Burgundy as a whole. 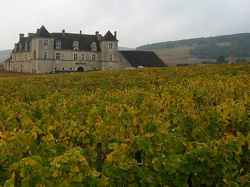 The Clos de Vougeot vineyard was created by Cistercian monks of Côteaux Abbey. The land making up the vineyard was purchased by the Cistercians, or donated to them, from the 12th to the early 14th centuries. By 1336 the vineyard was complete and a wall had been built around it. Château de Clos de Vougeot, situated inside the wall, was added in 1551 by rebuilding and enlarging a small chapel and some other previously existing buildings at the site. The Clos de Vougeot was officially classified as Grand Cru in 1937, when the whole Clos was granted this prestigious title; delimited according to the location of the Clos wall rather than the actual quality of the terroir. The Confrérie des Chevaliers du Tastevin moved into the Château du Clos de Vougeot in 1945. The Order has some 12,000 knights or Chevaliers worldwide and is devoted to defending Burgundy in grand style. Ever since its creation in 1934, the Confrérie des Chevaliers du Tastevin has set itself the task of promoting Burgundy, notably its wines and cuisine, preserving and reviving its traditional festivals, folklore and customs, and encouraging the development of tourism in the region. This estate was originally founded in 1850 by Jean-Baptiste Laroze in Gevrey-Chambertin, where it has holdings in many of the best Premier and Grand Cru vineyards as well as in Clos Vougeot, Musigny and Bonnes Mares. The Drouhin side of the name was added in 1919 when his granddaughter, Suzanne, married Alexandre Drouhin who owned vineyards in Chambolle-Musigny. Each successive generation has made its own contribution to developing and improving the estate, in terms of both the size and quality of its appellation. It is currently run by Phillipe and Christine Drouhin whose natural approach to growing vines lets the terroir speak for itself. Phillipe limits yields, even in prolific years, and employs wine-making techniques which retain the maximum fruit quality. Dijon began as a Roman settlement (called Divio) located on the road from Lyon to Paris. This province was home to the Dukes of Burgundy from the early 11th through the late 15th centuries. Dijon was a place of tremendous wealth and power, and one of the great European centers of art, learning and science. Dijon has one of the best preserved medieval centers in France. It is easy to walk and see the sites, with lots of pedestrian walking streets. 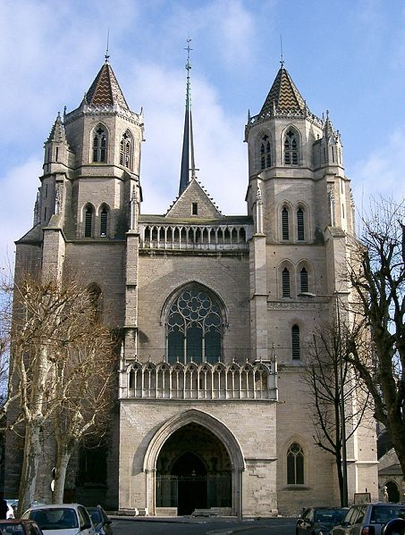 Dijon boasts a large number of churches, notably Notre Dame de Dijon, St. Philibert, St. Michel Dijon Cathedral, the crypt of which, dedicated to Saint Benignus, dates from 1,000 years ago. The city has retained varied architectural styles from many of the main periods of the past millennium, including Capetian, Gothic and Renaissance. Many still-inhabited town houses in the city's central district date from the 18th century and earlier. 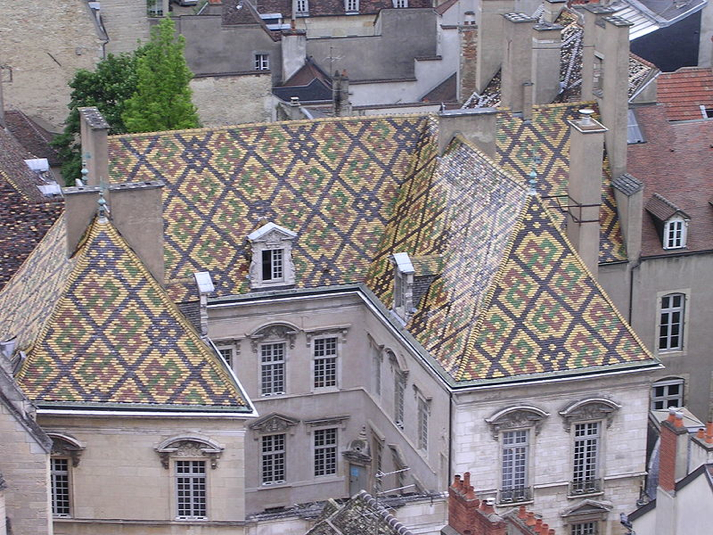 One distinguishing feature of Dijon architecture are the Burgundian polychrome roofs (toits bourguignons) made of terracotta, green, yellow and black glazed tiles arranged in eye-catching geometric patterns. CULTURE: Dijon holds its International and Gastronomic Fair every autumn. With over 500 exhibitors and 200,000 visitors every year, it is one of the ten most important fairs in France. Dijon is also home, every three years, to the international flower show Florissimo. Dijon has numerous museums such as the Musée des Beaux-Arts de Dijon, the Musée Archéologique, the Musée de la Vie Bourguignonne, the Musée d'Art Sacré, and the Musée Magnin. It also contains approximately 700 hectares of parks and green space, including the Jardin Botanique de l'Arquebuse. 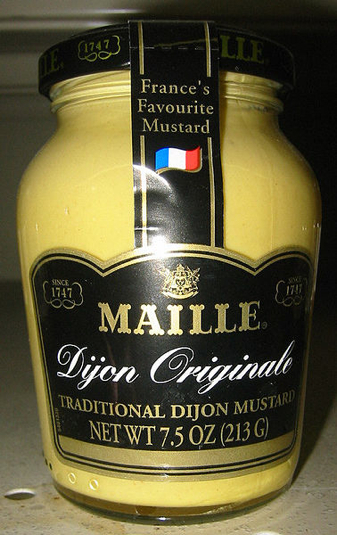 MUSTARD: Dijon is famous for its mustard. The term Dijon mustard (moutarde de Dijon) designates a method of making a particularly strong mustard relish. Dijon mustard is not covered by a Protected Designation of Origin (PDO) or a Protected Geographical Indication (PGI) under the auspices of the European Union; thus, while there are major mustard plants in Dijon and suburbs, most Dijon mustard is manufactured outside of Dijon. Dijon mustard originated in 1856, when Jean Naigeon of Dijon substituted verjuice, the acidic "green" juice of not-quite-ripe grapes, for vinegar in the traditional mustard recipe. Mustards from Dijon today generally contain both white wine and burgundy wine. Mustards marketed as Dijon style may contain one or both of these wines or may substitute vinegar or another acid in order to conform to local laws. Dijon mustard shops also feature exotic or unusually-flavored mustard (fruit-flavoured, for example), often sold in decorative hand-painted faience (china) pots. WINE & LIQUEURS: As the capital of the Burgundy region, Dijon reigns over some of the best wine country in the world. Many superb vineyards producing vins d'appellation contrôlée (AOC), such as Vosne-Romanée and Gevrey-Chambertin, are within 20 minutes of the city center. The town's university boasts a renowned oenology institute. The road from Santenay to Dijon, known as the route des Grands Crus, passes through an idyllic countryside of vineyards, rivers, villages, forests, and 12th century churches. The city is also well known for its crême de cassis, or blackcurrant liqueur, used in the drink known as "Kir", a mixture of white wine, especially Bourgogne aligoté, with blackcurrant liqueur, named after former mayor of Dijon canon Félix Kir. CUISINE: Dijon is home to some of the finest French cuisine. Well-known regional dishes include Boeuf Bourguignon, Coq au Vin, Escargot, Gougère and pain d'épices (the local form of gingerbread). The tradition of pain d'épices de Dijon dates back to the 14th century. Today it is predominantly made of rye flour and honey, with the addition of spices such as clove, ginger, cinnamon and sometimes anise. It is often garnished with candied fruits. It is much different to gingerbread cookies. Dijon's Palais des Ducs et des États de Bourgogne was home to the Dukes of Burgundy. It is a remarkably well-preserved. The oldest part is the 14th and 15th century Gothic ducal palace and seat of the Dukes of Burgundy, made up of a logis still visible on Place des Ducs, the ducal kitchens on Cour de Bar, the tour de la terrasse (or tour Philippe le Bon, a "guette" overlooking the whole city) and tour de Bar. Most of what can be seen today was built in the 17th and especially the 18th centuries, in a classical style. Be sure to visit its Musée des Beaux-Arts and climb the Tour de Philippe le Bon for an impressive view of Dijon. 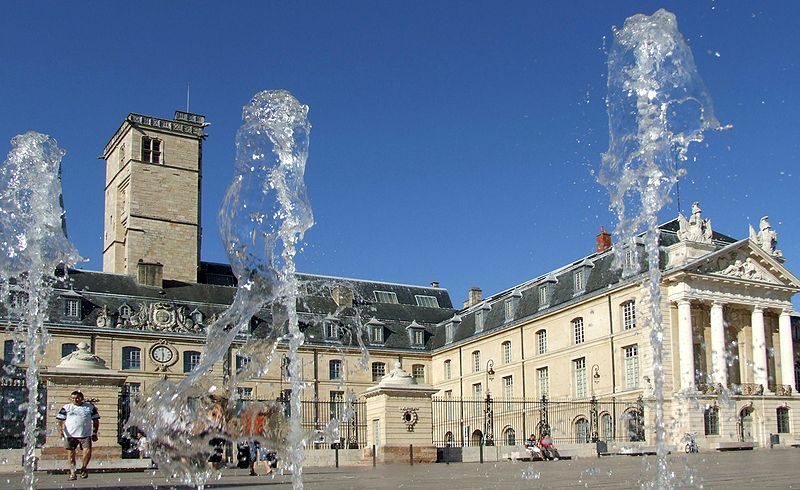 The wonderful Place de la Liberation is across from the palace, where you can sit in a restaurant, wine bar or cafe to leisurely view the palace and the interesting fountains with their undulating shafts of water that light up at night. 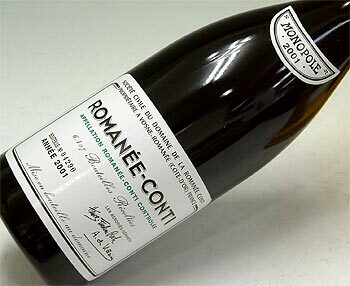 Domaine de la Romanée Conti is co-owned by the de Villaine and Leroy/Roch families, the former successors to Jacques-Marie Duvault Blochet who bought the vineyard of La Romanée Conti in 1869, the latter since acquiring the shares of other descendants of Duvault-Blochet in 1942. The Domaine is today run by Aubert de Villaine and Henri-Frederic Roch. Many people in Burgundy just refer to `DRC' as "the Domaine". The wines are made by Bernard Noblet in succession to his father André Noblet. Whole clusters are used (no destemming) with a long vatting time avoiding excesses of heat.Yields are mind numbingly low and the winemaking is traditional and perfectionist. These are not merely among the most sumptuous wines of Burgundy but certainly the most stylish. Ancestor Jacques-Marie Duvault Blochet was an advocate of harvesting late in order to ensure optimum ripeness, a philosophy to which his descendants adhere today.